Wembley Stadium in London, England was the host site for tonight’s Heavyweight Championship fight between Anthony Joshua and Alexander Povetkin for the IBF, WBA, and WBO Heavyweight titles. A mega fight between Tyson Fury and Deontay Wilder was just announced for December 1st on Showtime, and the winner of the Joshua and Povetkin fight will likely, and hopefully, face the winner of tonight’s bout in the near future. The undercard featured several good prospects. Sakhram Giyasov defeated Julio Laguna by a fourth round KO, Sergey Kuzmin defeated David Price by 4th round TKO, and Lawrence Okolie defeated Matty Askin by points. The co-main event of the night was between Yvan Mendy and Luke Campbell in a lightweight eliminator for the WBC title. Luke Campbell was in clear control for a majority of the fight and pulled out the decision win with scores of 119-109, 118-111, and 116-112. Anthony Joshua (21-0) and Alexander Povetkin (34-1) met in the main event of the evening before a very pro Anthony Joshua crowd. Povetkin, the first man to enter the ring, was met with a loud chorus of boos and whistles. Joshua towered over Povetkin, who had to use good head movement early on to avoid the jab of Joshua. Povetkin was able to land some good right hands to the body, and ended the opening round with a good combination. Joshua came out aggressive in the second round but had a bloody nose by this point. Povetkin was able to land some good right crosses to the head and body, but Joshua started to pump his jab with more regularity. Joshua opened up the third round with a solid short right hand, but Povetkin was able to answer with an over the top right hand. Joshua landed a few good uppercuts and left hooks and likely took the round with his accurate punching. Povetkin had a cut open up by his left eye in the fourth round, and by the fifth round Joshua had landed 30 jabs to the 2 jab that Povetkin landed. But Povetkin was throwing and landing more power shots than Joshua at this point. Povetkin got tagged with several good jabs by Joshua in the sixth round. Povetkin was aggressive and tried to hurt Joshua with short right hands, but often landed on the guard of Joshua or swung at air. 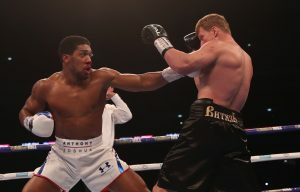 Joshua opened up the seventh round circling away from Povetkin, who was coming forward with straight right hands. Joshua landed a sudden straight right hand that hurt Povetkin and followed it up with a combination that ended with a right hook that sent Povetkin down. Povetkin looked hurt but was able to get back to his feet, but was still badly hurt. Joshua jumped on Povetkin with another combination that forced the referee to jump in and stop the fight. Anthony Joshua wins by TKO at 1:59 of the seventh round.